Compatible Printheads Epson* DX5, DX7, 5113. 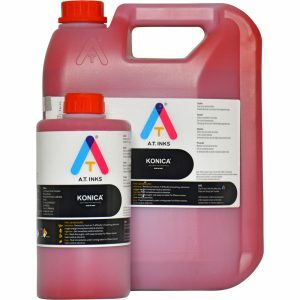 AT Inks, Robuste™ Hi Grade, a premium line of dye-sublimation inks, are high density, water based inkjet inks designed for a wide range of wide format printers. The inks are designed to be printed on coated transfer paper. The image printed on transfer paper is transferred onto polyester fabrics and onto coated rigid substrates under heat and pressure.